It is not a mystery to anyone that Chinese products are the "big deal" of the 21st century. Low prices and (generally) surprisingly high quality are making their popularity go ballistic among audiophiles on a budget. Sometimes one is forced to buy directly from Chinese dealers (Cattylink and others), more often these products are regularly imported and distributed worldwide. Of course, buying direct helps keeping prices extremely low. US Blaster is a Netherlands-based Company that distributes China-made products in Europe and worldwide. Their catalogue is full of electronic components of every kind: car stereos, components, portables, DJ gear, pro audio and Home Theater products. Among these, there's a series of loudspeakers that seemed quite interesting to me. This big, extremely inexpensive floorstander is the first product I've been able to put my hands on. Hopefully more will follow, as I've detected at least another pair of speakers that should be interesting. The first thing that catches the eye is the strong resemblance with a well known audiophile loudspeaker, the B&W 604 S3. A three-ways design into a huge 11.5 cm vented enclosure, with a kev-like 17 cm (6.5") midrange, two 17 cm woofers and a 1" soft dome tweeter. 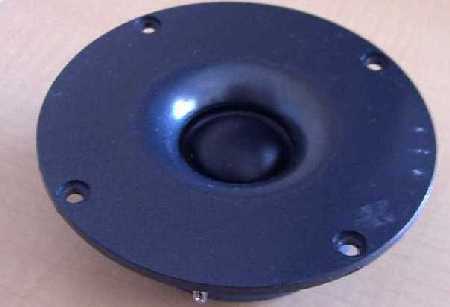 The speakers are claimed to be of the shielded type, but this is uncorrect as the drivers are NOT shielded (see pics). The crossover design is pretty simple, though it sports a MKP "Audiophiler" (???!!!) cap on it (the yellow one in the pic at your right). Internal wiring is made with good size cables. 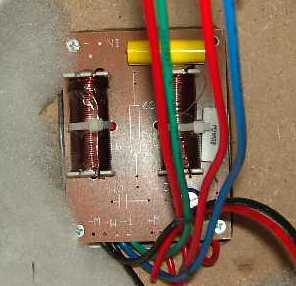 Drivers connections make use of fast-on connectors (no solderings). The MDF cabinet is divided into two parts: midrange and tweeter are completely separated by the woofers reflex acoustically-damped chamber. 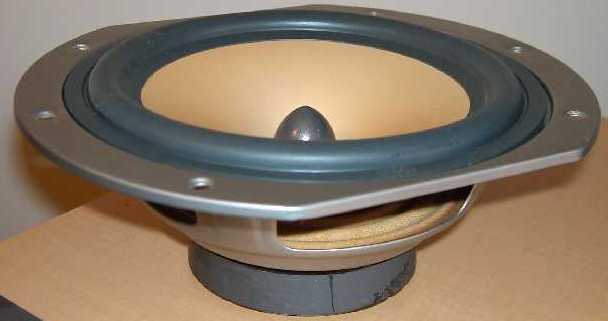 The loudspeakers are claimed to be designed by P.A. Inc. USA and manufactured by US Blaster (in China). Besides taking several pics of the drivers and of the cabinet I haven't been able to do anything else. No owner's manual or more detailed tech specs were supplied. 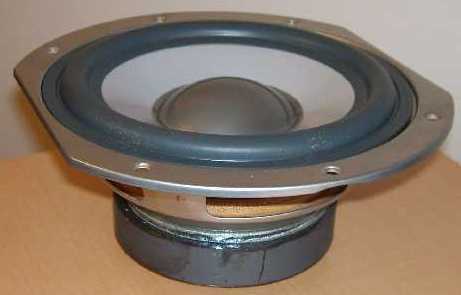 The speakers are equipped with APPARENTLY biwireable binding posts (see later), not of the gold-plated variety. 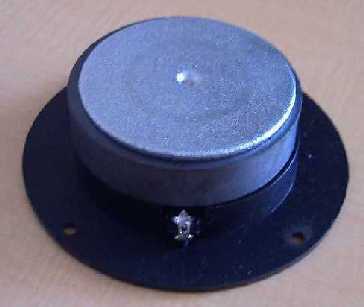 A set of four small rubber feet is supplied with each loudspeaker. The cabinet is pretty light and prone to resonate. I've evaluated the USB 4011 over a long period of time thanks to the courtesy of the Italian distributor (Daemon.it). During my tests one of the tweeters started making nasty noises and produced some distortion. Perhaps it had been damaged during transport. An e-mail to the distributor and a new unit was ready to be installed in very short time (kudos for that). I expected a completely and definitely "in yer face" kind of sound, with an edgy and shouting mid-high range. Not so. The overall balance is loudness-like, instead. Bass and highs above the rest, with a recessed mid range. And no, don't imagine that kind of "boom-boom tizz-tizz" sound of cheap car stereos or boom-boxes. No, these 4011's can be considered - without doubt - real HiFi loudspeakers. They do not sound aggressive or harsh. Quite the contrary, indeed. Anyway, I've listened to other loudspeakers exhibiting a tonal balance so peculiar, in some way. The less convincing performance is due to the midrange unit. Indeed, it doesn't sound precise or transparent. It always tends to remind you are listening to an inexpensive loudspeaker. Voices, especially female ones, aren't all that bad, either. Male voices, instead, suffer from lower mid-bass colouration, probabily due to some cabinet unwanted resonance. The general feeling is that of a quite artificial sound but, what would you expect for 2 x 100 € bills? Among instruments the most "offended" one is the piano, which sounds slightly "behind" the rest even when it shouldn't. Guitars and stringed instruments in general, though not harmonically rich, are lively and sound with a good sense of realism and presence. The general feeling is that this loudspeaker isn't probably 100% correct but it is still enjoyable. Transparency and precision aren't top notch but you can still get lots of information from your records. Clearly, these speakers have been designed for the masses, being more "at home" with Pop and Rock Music. With Classical, that midrange lacks the brilliance and precision needed to give a good picture of a whole orchestra (but so perform most of the sub-200 speakers I've tested). With electrified Music, especially if very "rythmic", the performance is very involving, way above one might expect. These speakers are real entertainers, somehow. I hope it is clear I'm trying to forget the price tag of these. For 200 € or so you can buy a pair of cheap and small bookshelf loudpspeakers, instead. Then add the cost of a decent speaker stand. Perhaps - repeat after me: PERHAPS - you can get a better midrange and some more precision overall but you won't ever get such a really "full-range" sound. Of course, as usual, you win something, you lose something. Up to you to decide which "absence" is less harmful to your musical fulfillment. These speakers are spec'd to have an impressive 150 watt RMS power handling. Furthermore, having a near-90 dB sensitivity, these USB 4011's can sound really, really loud. And quite dynamic, too! Their best performance, in this area, comes from the bass range: tight, fast and extremely powerful. Drum & bass fans won't be disappointed, both for "quantity" and "quality". All the explosive sound of the drums in "Rage against the machine" (first album, a mine-field for lesser systems) is reproduced with a stunning sense of realism. It seems you can turn the volume higher and higher and never experience dynamic compression. Attacks and decays are reproduced with lots of realism, energy and control. In the rest of the audio spectrum the dynamic performance is slightly affected by the midrange unit, which seems unable to cope with the crisp and fast sound of the woofers. Hence, there's some trace of slowness and you get the feeling of a 2-speeds loudspeaker. Tight and lively in the bass, sometimes slow in the mid. The tweeter is a better unit than the midrange and succeeds in counterbalancing it, hence the overall performance in the mid-high range isn't all that bad. In the microdynamics department you can't ask for a razor-sharp performance but I dare to say that these 4011's perform way above the "expected". Certainly, the good tweeter plays a relevant role, here. The speakers are quite big and this normally implies they find hard time "disappearing" from the listening room. The fact they also use 4 drivers doesn't help, either. Of course, there are remarkable exceptions (big Thiels, Wilson Audio, Avalon etc.) but budget designs can be "detected" most of the times. Hence, from time to time, you can hear some instrument playing right "inside" the boxes and there's no amount of toe-in that can fix this. Following my direct experience I suspect that the more a cabinet resonates, the more you can detect the speaker in your listening room. This happens because the sound source becomes larger than it should be since it is the whole structure that "plays". Don't forget ideal sound diffusion should be created by a point source! Now, since the cabinet of these 4011's is quite prone to resonate, the ability of the drivers to "disappear" is heavily affect by the "sound" of the front baffle, and of side and rear panels. This notwithstanding, there's a reasonable soundstage that extends the space between the loudspeakers (side by side, back and forth). There's even a sense of depth and height of the stage. One shouldn't expect "sharp" contours or perfect focus on singers and players (there's some blur, indeed) but the whole performance is adequate, considering the price tag. I'm pretty sure things can get better with some "tweaking" of the cabinet, aimed at dampening structural vibrations. Some break-in is necessary, just to tame some edginess in the highs and mids. Installation is quite easy and troublefree. The speakers are big but are not impossible to place even in a small room. Some toe-in might be recommended, though. Considering the powerful bass range, avoid placing them close to the rear wall. These USB 4011 seem an easy load, even the tiny T-Amp drove them effortlessly. Sensitivity is around 90 dB/w/m and this means that with the power output of a T-Amp you can get decent sound pressure and dynamics in a mid-sized room. The combo T-Amp + external PSU + USB 4011 costs 300 € more or less. Hard to imagine something cheaper that sounds better. Add a 100 € CD player (or DVD player) and you have a complete stereo system for 400 € or so. This is - more or less - the same price tag of those ugly all-in-one compact stereos. Trust me, sound quality is miles away. Furthermore, these speakers seem the ideal playground for insane tweakers. The cabinet can be easily made less resonant with damping sheets and, eventually, braces. 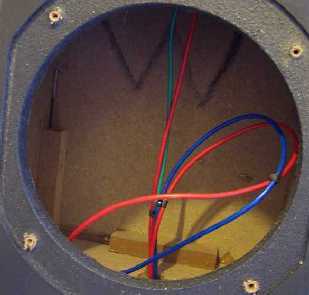 The midrange and woofer baskets can benefit from some adhesive damping sheet. The crossover is fairly simple: passive components can be easily upgraded with audiophile-grade stuff. Internal wiring seems decent but rewiring with CAT 5 stuff could provide interesting results. 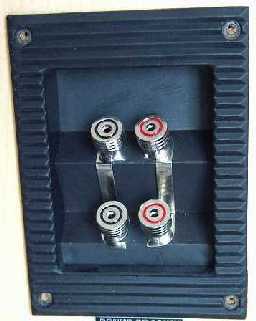 Some blue-tack between drivers and cabinet should help in minimizing vibrations and air leaks. All of these "tweaks" can be performed (and reversed) quite easily, with a very low budget. Manufacturing and finish. 250 € for a pair of such huge floorstanders is a ridiculously low amount of money. Unbelievably low if you consider the "middle-men" price increase: manufacturer --> international shipping --> European distributor --> shipping --> Italian distributor. I'm shocked: how much does it cost to produce such a pair of speakers??? Anyway, the quality of the manufacturing is pretty low or I'd better say it is adequate considering the extremely low price tag. Though the midrange is a poor imitation (call it Kev-like) of more expensive and famous units, woofers and tweeters seem of good quality, with reasonably sized magnets and good "finish" overall. Binding posts aren't the best around (not even gold plated) and - what's worse - biwiring is NOT possible. Actually the two pairs of posts can't be connected independently. A fake biwiring, actually! Definitely not good. The cabinet is reasonably finished but it is very light and prone to resonate. The owner's manual seems unavailable and the shipping boxes are extremely thin and fragile. Polystyrene cushions or "halves" are missing. Just two small shock absorbers on top and bottom and that's all (talking about cost shaving, eh?). The speakers are claimed to be Home Theater-ready, with shielded drivers. This, as anyone can detect just looking at the pics, is clearly false. The drivers are NOT of the shielded type. Hence, using the speakers close to a TV set might cause colour alterations on the screen. Sound. Considering the price it is already surprising the fact these speakers sound :-) Actually, these are the less expensive big floorstanders I know of. Of course, there are aspects I don't like: a too recessed midrange paired with a loudness-like tonal balance. Then comes imaging, which appears too closely "linked" to the speakers. The mid-bass isn't perfectly "clean", I'm sure the resonancies of the cabinet add something relevant to this portion of the audio spectrum. I like to experiment and explore new territories. When I saw such a big floorstanding speaker at such unbelievably low price I couldn't resist. The result has been quite interesting: sound quality, thanks to low cost manufacturing, is starting to reach levels we couldn't even dream of, say, 10 years ago. At the price of a set of mid-class interconnects, one can buy a pair of big loudspeakers that can deliver a decent HiFi sound. A stunning result, considering the money involved. Though not in the T-Amp territory, the quality/price ratio of these speakers is simply...astounding.